The sonata unfolds in approximately 30 minutes of unbroken music. While its four distinct movements are rolled into one, the entire work is encompassed within the traditional Classical sonata scheme— exposition, development, and recapitulation. 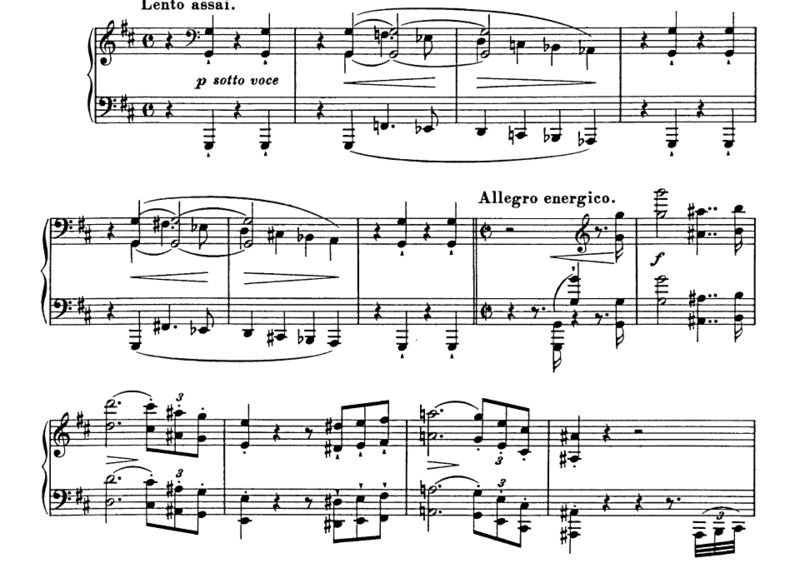 Liszt has effectively composed a sonata within a sonata, which is part of the work’s uniqueness. The first theme is a descending scale marked sotto voce, full of ominous undertow it is destined to reappear at crucial points in the work’s structure. 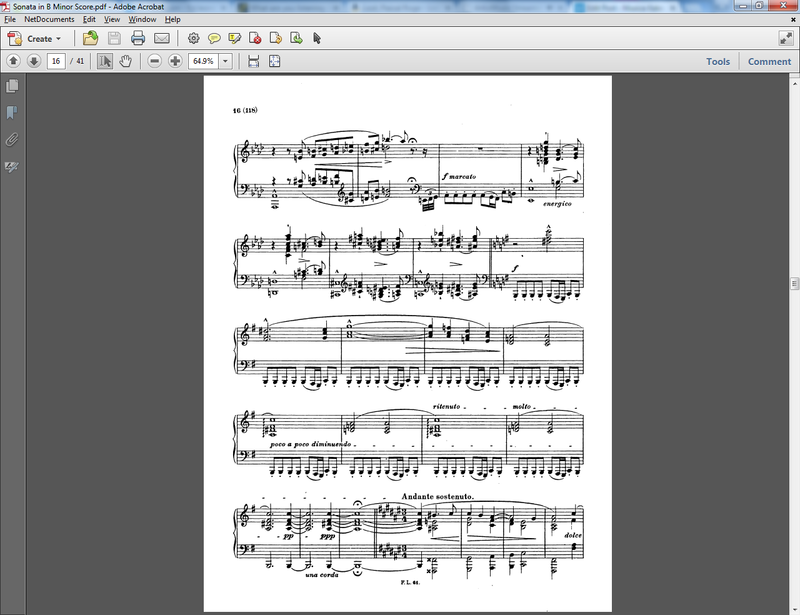 Leading immediately to a jagged, forceful theme in octaves. 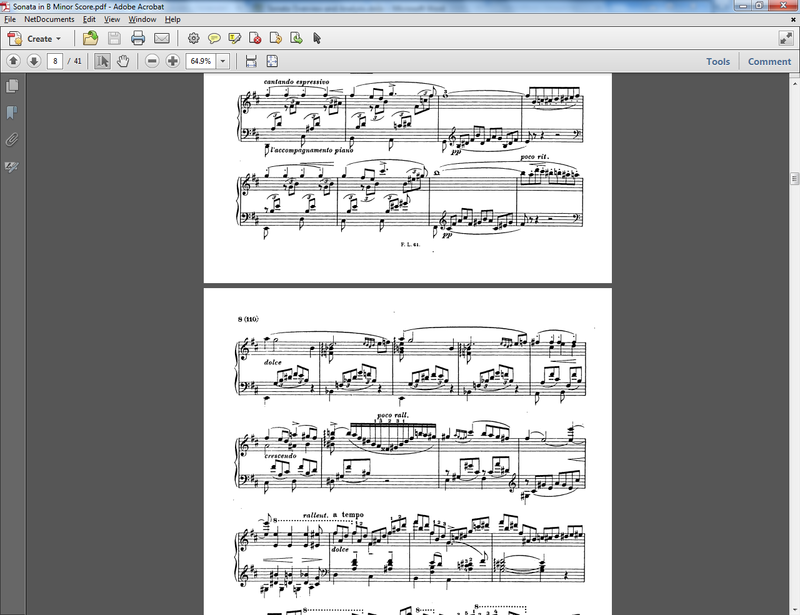 This is quickly followed by a hammering marcato idea in the left hand. A dialogue ensues, with mounting energy, until reaching the noble grandiose second subject in D major. Liszt transforms the left­-hand theme into a lyrical melody of exquisite loveliness. The slow movement, an Andante sostenuto of haunting beauty, is the centerpiece of the sonata. This fully fledged “compound ternary” form features in quick succession a number of themes heard earlier in the sonata in a tour de force of thematic economy. The final recapitulatory section is launched by a driving fugato of contrapuntal skill which leads to the compressed return of the opening material. Calling upon every intellectual resource and fully exploiting the pianist’s technical arsenal, it is at this point where a performer’s concentration might flag. But this final section has only just begun, and a pianist needs to have reserved fuel in his tank if he is to turn in a successful performance of the sonata. Liszt builds the music to one last titanic climax until finally a dramatic silence ushers in the twilit epilogue: the andante sostenuto melody reappears to serene and touching effect and the curtain comes down on this compositional tour de force. 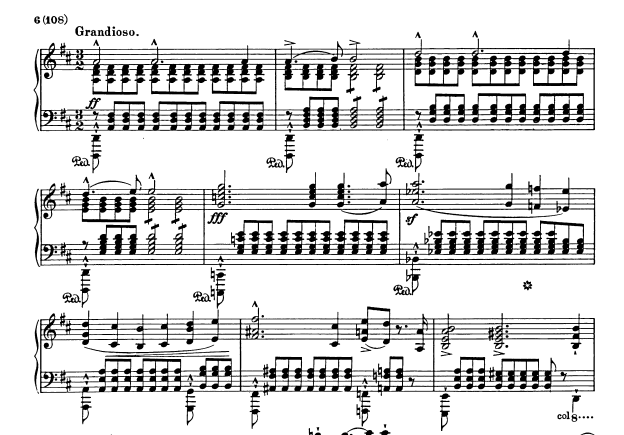 Liszt originally intended the sonata to end with a loud flourish; the manuscript reveals that the inspired quiet ending with which the work now concludes came to him as an afterthought. Posterity must be grateful for the unpredictable ways of genius. After a cataclysmic climax, followed by a long silence, Liszt brings back the soft Andante sostenuto, which seems to cast a benediction over all that has gone before, and the sonata expires with the same descending scale with which it began. Buechner, Sara D, and Humphrey Searle. 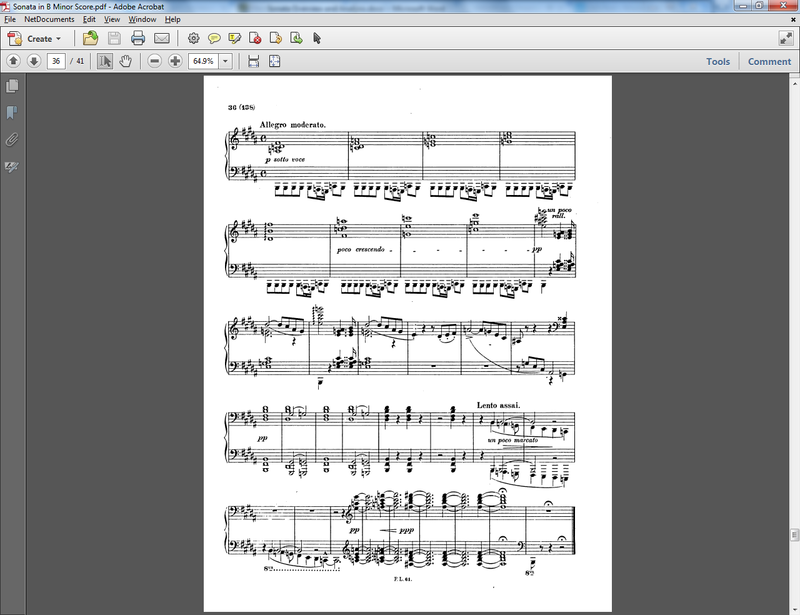 The Music of Liszt. 2013. eBook. 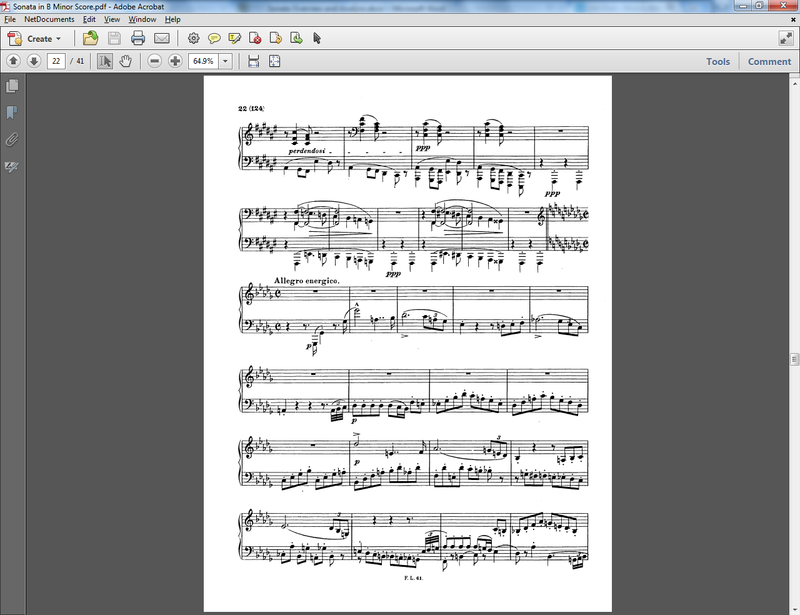 Hamilton, Kenneth, “Liszt’s early and Weimar piano works,” in The Cambridge Companion to Liszt, ed. Kenneth Hamiton, Cambridge University Press, Cambridge, 2005. Litzmann, Berthold. Clara Schumann: Ein Künstlerleben. 3 vols. Leipzig, 1902– 08. Merrick, Paul. Revolution and Religion in the Music of Liszt. London, 1987. Ott, Bertrand. “An Interpretation of Liszt’s Sonata in B minor.” Journal of the American Liszt Society (Louisville, Ky.) 10 (December 1981), pp. 30– 38. Raabe, Peter. Franz Liszt: Leben und Schaffen. 2 vols. Stuttgart, 1931; rev. ed., 1968. Szász, Tibor. “Liszt’s Symbols for the Divine and Diabolical: Their Revelation of a Programme in the B-minor Sonata.” Journal of the American Liszt Society (Louisville, Ky.) 15 (June 1984), pp. 39– 95. Walker, Alan, Franz Liszt: Volume 1, The Virtuoso Years: 1811-1847 (New York, Alfred A. Knopf, 1983. Walker, Alan. “Franz Liszt: The Weimar Years, 1848–1861.” Ithaca: Cornell University Press, 1989. Winklhofer, Sharon. 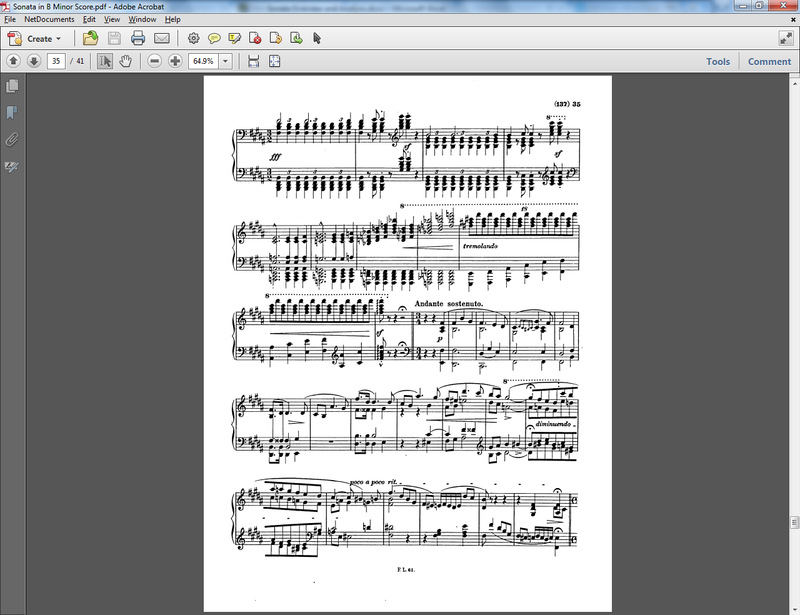 Liszt’s Sonata in B minor: A Study of Autograph Sources and Documents. Ann Arbor, 1980. Which of these themes is sometimes referred to as the crucifixion theme? 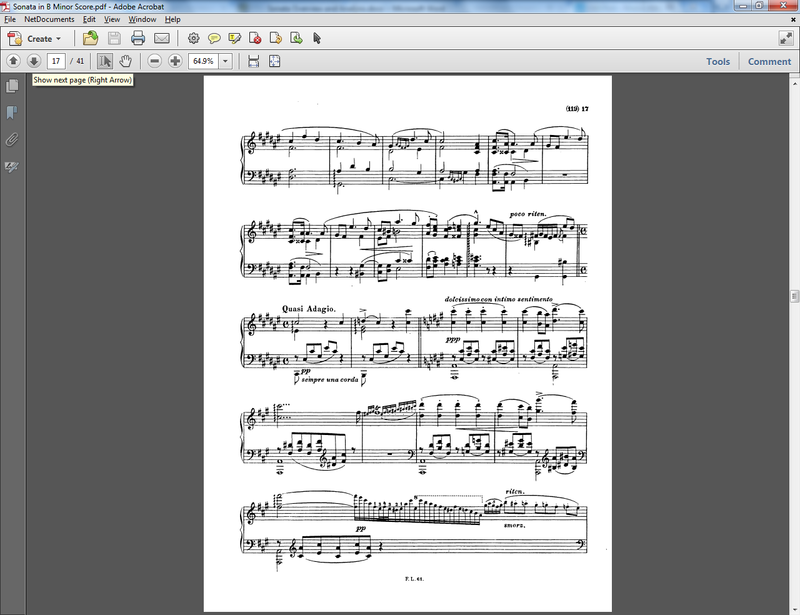 We talked about this piece extensively in my grad piano lit class, but right now I can’t remember. The cross motif is a three note motif coming from the fifth, sixth and eighth degrees of the major scale (or so-la-do’ using tonic solfege). This is a brilliant, helpful analysis! !